There are a number of high quality prepared pastas on the market today, and tortellini is one of my favorite pastas to cook. 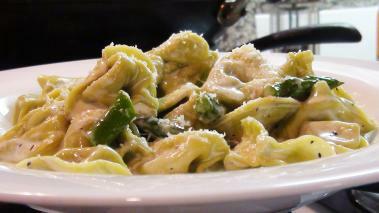 This recipe is for a tortellini alfredo with fresh asparagus. Alfredo sauce is super easy to make, really just some reduced cream and a bit of parmesan cheese. But is can also be pretty heavy. To lighten the dish a bit I blanch and toss in the asparagus, which works very well with the pasta and sauce, and gives you the added benefit of a adding a vegetable to your meal. Hope you enjoy it! Like all pasta recipes make sure you cook the tortellini al dente. Start tasting before the package suggests it will be done. I like to take it out about 30 seconds early and finish it in the sauce. Asparagus can be very tricky to pair with wine, and often clashes. That limits the choices somewhat, but fortunately, the creamy alfredo sauce simplies matters greatly. While I'd still avoid most red wines, a dry chardonnay without too much oak would work very well.